Since at least 2007, Goldcorp Inc. and the government of Honduras have known about, and covered up, information about blood poisoning and health problems caused by Goldcorp’s open-pit San Martín mine in the Siria Valley, department of Francisco Morazán, central Honduras. This mine is operated by Goldcorp’s subsidiary Entremares. Although Goldcorp suspended its mining operation there in 2008, villagers in numerous towns near the mine site are suffering recurring health problems, even today. Local residents – as well as cows – have died of health problems likely caused by the mine. 14 year old Abel shows rashes that have recurred for years. 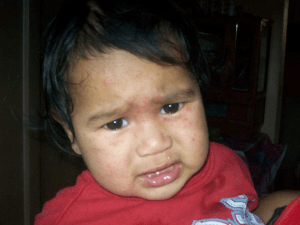 Abel’s blood, based on the just released 2007 government studies, contains over twice the levels of blood-lead content for children recommended as safe by the Centre for Disease Control and Prevention (CDC). 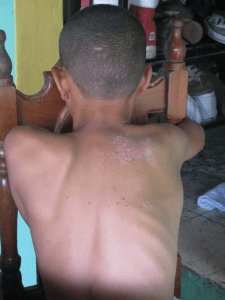 From El Pedernal, a village near the Goldcorp mine, Abel started experiencing health problems as early as 2003 when he began losing chunks of hair. Had Goldcorp and the government of Honduras released the results of their 2007 blood and urine samples, and accepted responsibility to care for the health problems caused by the mine, villagers in the Siria Valley might have received appropriate medical attention. Instead, the results were covered up until now. Still, neither Goldcorp nor the government have accepted responsibility. Soon after Goldcorp began operating the San Martín mine in 2000 (then owned by Glamis Gold, bought out by Goldcorp in 2006), villagers in the Siria Valley began complaining about the effects of the mine on their health and water sources. Their genuine complaints were met with denials and/or silence from the government of Honduras and Goldcorp. After years of community organisation, protests and advocacy concerning the health and environmental harms, independent health experts first carried out blood and water tests in the mine affected communities of Siria Valley in 2005-06. These initial studies found dangerously high levels of lead and arsenic (naturally occurring heavy metals released into the air and water in dangerous levels via the gold mining process) in people’s blood, but were discounted by Goldcorp and the Honduran authorities, claiming that they were not official studies. As the increasingly obvious evidence of health and environmental harms mounted (hair loss, skin rashes, miscarriages in women and cows, dying cows, etc) and as pressure mounted from the Siria Valley Environmental Defense Committee (comprised of people from the mine affected communities) and other human rights and nongovernment groups, the government of Honduras carried out its own study in August 2007, taking blood and urine samples from a random and representative sampling of 62 children and adults in communities near Goldcorp’s San Martín mine. ‘Experts’ contracted by Goldcorp observed and were present during much of the blood and urine sampling process. Upon completion, the government of Honduras did not release the results. Rather, the Ministry of Environment claimed a need to send the samples to ‘experts’ in Colombia, for further verification. Again, ‘experts’ contracted by Goldcorp traveled to Colombia to ‘accompany’ the blood and urine samples verification process. From that moment, until this year, a silence has surrounded the results of those studies, despite constant demands from the mine-affected communities of the Siria Valley to get the results, Then on April 12, 2011, almost 4 years after the samples were taken, the 62 individuals began to receive the results of the levels ofarsenic, mercury and lead detected in the blood tests in 2007. Notably, the results of studying the urine samples have still not been released. What is known, in summary, is that of the 62 people sampled in 2007, 46 of them (27 children and 19 adults) have dangerously high levels of heavy metals poisoning in their blood that would have required immediate and sustained medical treatment back in 2007, let alone today. Twenty-four of the children studied contain dangerously elevated lead levels in blood (10 ug/dl = 10 micrograms of lead/decilitre of blood), according to World Health Organisation and CDC standards. For a representative and random sampling of villagers near Goldcorp’s mine, these are extremely high percentages of villagers with indications of blood poisoning. The implications for the local population at large would have been alarming in 2007, had they been advised. They are just as alarming now, as villagers living near the mine site have continued to be exposed to the water and environmental contamination that has never been acknowledged by Goldcorp and the government of Honduras, let alone remedied. What also appears clear is that Goldcorp knew of and therefore – we believe – helped cover up the blood test results by using its own ‘experts’ to oversee the process of collecting data. In a further attempt to cover up this information and silence Siria Valley villagers, the Honduran government – with the reported knowledge of Goldcorp – now is going door-to-door to the homes of the 62 individuals, asking them to sign what appear to be confidentiality and waiver papers, and offering to take them to the public hospital in Tegucigalpa to treat them, based on the test results which revealed heavy metals found in their blood almost four years ago. This appears to be an effort to undermine the on-going work of the Siria Valley Committee, CEPRODEC and Dr. Juan Almendares; it is an attempt to silence sick individuals and stop any possible legal repercussions in the future.